For salaried and self-employed individuals in India, filing income tax returns is very important. And with Aadhaar becoming an essential document, it is important to link your bank account, phone number, EPF account and PAN with Aadhaar. It also has many more uses that ease things, especially for those who file their income tax returns. Usually, after you have filed your taxes, you get the ITR-V that you need to print, sign and send it to the income tax office. But, in today’s era where everything is going digital, your Aadhaar gives you yet another way to verify your ITR-V. Here’s how to do it. To begin with, you need to register yourself on the income tax portal here. On the right, you will see an option to register, and login option (for those who have already registered). For those who are registering for the first time, your user ID is generally your PAN number. Enter your name, surname, date of birth, and residential status. Click on continue. Complete the registration form, which includes adding your PAN number and other details, followed by verification, and once the registration is successful your account will be created. To link your Aadhaar with income tax returns, login to the portal, hover the cursor on ‘Profile Settings’ on the right, and click on ‘Link Aadhaar’ in the dropdown menu. Here, you will need to enter your Aadhaar number after which an OTP will be sent on your registered mobile number. Once the code is authenticated, your Aadhaar will be linked with your income tax returns account. To file your income tax returns online, login to the portal and a link that says ‘Filing of Income Tax Returns’ click on that. 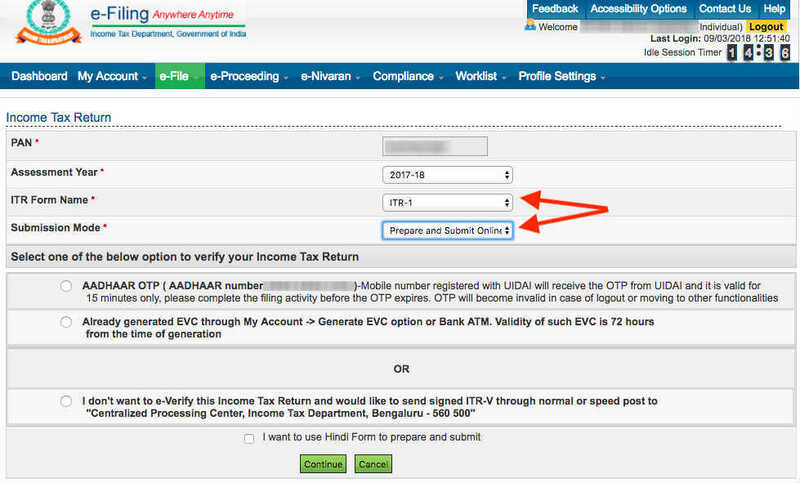 On the next page, your PAN number will be shown, and then you will have to select the assessment year, ITR Form Name and Submission mode. You will also need to choose between Aadhaar OTP to verify your returns or send the print out via post. Now click on next to continue. Here, you will need to add your income details, tax deductions and other details about your investments. A computation of your returns or the tax that you are liable to pay will appear on the screen, and you can either pay the tax or click on submit if you are eligible to get a return. After you have successfully filed your income tax returns, you will have to e-verify your ITR-V using your Aadhaar. For this, login to the portal, hover the cursor to ‘My Account’ and click on ‘e-verify return’ from the dropdown. On the next page, you will have to choose the assessment year, followed by ITR Form name and then click on the e-verify option. It will send an OTP on your registered mobile number, and once that is successfully authenticated, your income tax return will be verified.